Cast in high strength alloy steel, these double-end rerailers can carry the weight of a 450 ton rail car or locomotive. 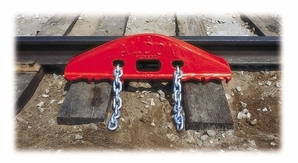 Chains (sold separately) secure the rerails to the rail. Used in pairs. Sold separately. Use both an inside and an outside rerailer.